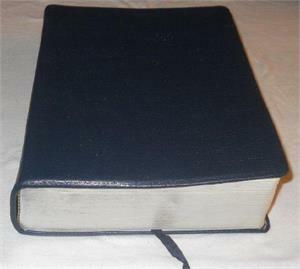 The Life Application Study Bible, one of today's best selling study Bibles, contains notes that not only explain difficult passages and give information on Bible life and times, but go a step further to show you how to "take it personally," as God’s Word speaks to every situation and circumstance of your life! It’s the one Bible resource that incorporates today’s top scholarship in answering your real-life questions and includes nearly 10,000 Life Application notes and features designed to help readers apply God’s truth to everyday life.Genuine Leather Bound. Book Condition: good. Fourth Edition, 2,432 pages. f. Map with key places found in the book. 02. Cross References are to the side of the scripture and paled in the reading of the scriptures. 03. Textual Notes examine alternate translations and Hebrew and Greek terms and meanings. 04. Sectional Headings gives you the subject and contents of each book. 06. Charts and Diagrams: Help you visualize difficult concepts or relationship. Most Charts are informational only. 10. Personality Profiles of Biblical People showing strengths and weaknesses, accomplishments and mistakes.